I know I said I'd share on how I made Counting Blessings Craft, I've had some unexpected surgery two week ago and I'm not allowed to do any work for another 6 weeks. I will not have step by step pictures, but I hope I can explain it. First of all you need a frame if you like the frame look. I made my frame but you can use any large frame if you want. You can almost do it any size you want, and if you don't work with wood you can always use cute scrape book paper or chip board for the numbers, but to use the hooks I used you will need wood for the backing. You will need a wood board to put into the frame, Paint it any color you want. Mine is painted the color "Linen" I glued three pieces of wood onto the base wood for the 3d look of "Children, Grand Children, Great Grand Children" (I have also made some that say "on the way") those 3 pieces of wood and the number tiles are all cut from 1/8-1//4 in wood. The wood with the numbers need a hole drilled in the top of each one, I made 2 sets of numbers with number on both side of the wood. there are 2 hooks under each title, the hook are found at Lowe's, Home Depot, Wal-Mart or your local hardware store. They are found by the cup hooks, they are shaped like an L. I bend the end of the hook a little flat so the wood number will slide on or off easily. You could probably also use a nail with no head. All the writing is done in Vinyl, I designed and cut the vinyl myself. I used black matte. If you have any question feel free to ask. I'm on pain meds and not sure if this makes sense to anyone else. Thank you for the tutorial! What font did you use for the big saying across the top? 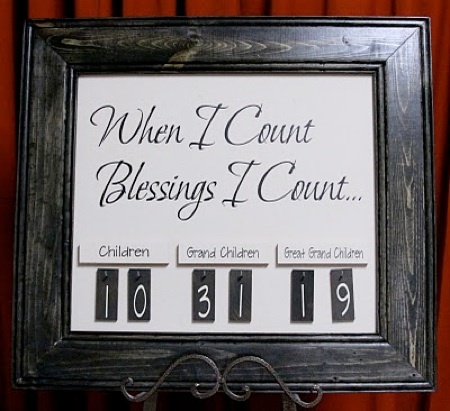 I really want to make the Count my blessing craft for mine and my husbands parents for Christmas. Would it be possible to get a tutorial up really soon? My question is, is that magnet board or just wood? I'm thinking I can do it all very simply if it's magnet board and just put it all on magnets, but the hooks are so cute. Oh, sorry, I thought I had posted this on a previous post of yours and just saw that this is the tutorial. Thanks so much! reader. What could you recommend in regards to your put up that you simply made a few days in the past? What was the size of your frame? And what size fonts did you use? Any info would be greatly appreciated! !